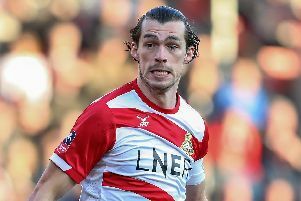 Player ratings: How did Doncaster Rovers players fare in derby defeat to Rotherham United? Rovers players are pictured at the end of the game. The Star’s Paul Goodwin analyses today’s devastating defeat at the New York Stadium. Coped okay with everything that Rotherham threw into the box but blotted his copybook by fouling Smith for the penalty - it was a challenge he did not need to make. Another very steady performance at right back. Did not shirk a tackle and also used the ball quite well. Headed and kicked danger away for fun before going off with a nasty-looking injury. Had he stayed on the game might’ve ended differently. Continued on from his no-nonsense display against Fleetwood but was not as commanding as Anderson. Kept busy by Anthony Forde but defended tenaciously and always went for the ‘safety first’ option. Replaced Luke McCullough in the holding role and did a decent job in there. Showed plenty of composure on the ball. Uncharacteristically played his teammates into trouble on one or two occasions but also got through some good work in midfield. Had Rovers’ best chance of the second half but was denied by Towell’s block. Drew praise from Paul Warne for a fine performance, displaying ice-cool composure in the heat of a derby day battle. A pleasure to watch. When he came off, Rovers crumbled - yet again. Showed some nice touches on the right side of midfield but struggled to really influence the game. Another to go off injured - and it looked like a bad one. Capped another workmanlike display with a brilliant goal. His and Kiwomya’s pressing from the front gave Rovers a real platform in the game and helped stifle the hosts. Closed down to good effect in the build-up to the goal and put in a real shift for the team. For Anderson, 56: Saved one goal with a brilliant clearance but caught out badly in build-up to the penalty. For Beestin, 79: Struggled to get into the game. For Coppinger, 90: Could not stem the tidal wave of pressure.